I make two different recipes for Cucumbers and Onions, both delicious but different from each other. The first recipe is made with sour cream, no mayonnaise. This recipe gives you a very creamy, cool, light, fresh feel in your mouth. The tart, sweet flavor is still there, along with a taste of dill. It’s absolutely delicious and a new favorite of my neighbors who taste tested it today. The second recipe is a classic Cucumber and Onion recipe made with vinegar, water and sugar. This is the recipe you grandmother and mother have been making for years. The recipe you grew up on, the recipe we think about when summer is here and cucumbers are plentiful. There’s room in your fridge for both versions of Cucumber and Onions when the heat of summer begs for something cool and delicious, Enjoy! 1 tablespoon white sugar, or to your liking. The ingredient amounts are a good base to start with, everyone’s tastes are different. Taste and adjust to your liking. Place your sliced cucumbers in a colander, place the colander into a large bowl. Sprinkle a good dash of salt over the cucumbers. The salt will release the water in the cucumbers so the dressing won’t be watery. Place a small plate over top the cucumbers, push down slightly. Set aside for a couple hours. Drain any water in the bowl. You can rinse the cucumbers in the colander to get rid of the salt if you like. Pat dry with a paper towel. Remove the cucumbers from the colander to a large bowl, add the onion and set aside. In a medium size bowl, combine the sour cream, apple cider vinegar, sugar, dill weed and salt and pepper. 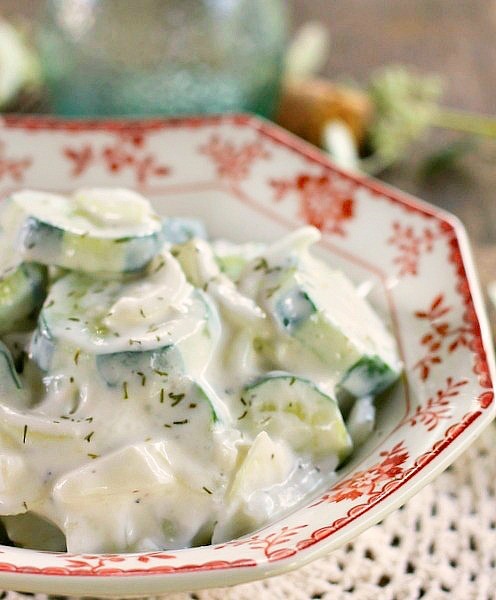 Whisk to combine, pour dressing over cucumbers. Fold dressing into cucumbers and onions gently, cover with plastic wrap and refrigerate, for at least 2 hours. Serve cold. Keep leftover Cucumber and Onions wrapped and refrigerated. 2 Tablespoons sugar, more if desired. In a large bowl, combine the cucumbers and onions. In a medium size bowl, combine the vinegar, water and sugar. Whisk together until sugar is dissolved. Pour over the cucumbers and onions. Cover with plastic wrap and refrigerate at least 2 hours. Serve cold. Keep leftover Cucumber and Onions wrapped and refrigerated. I personally love the one with vinegar. I make it and also add bell peppers and cherry tomatoes from time to time as well. Thanks for posting. Love your recipes. Thank you La June, the peppers and tomatoes sound delicious too! I love that bowl Robert! I bought it at a yard sale my 81 yr old neighbor was having. The bottom says …NIKKO Classic Collection.